New York Rangers President and General Manager Glen Sather announced today that the club has agreed to terms with free agent defenseman Brendan Bell. Bell, 28, has skated in 101 career NHL contests with the Ottawa Senators, Phoenix Coyotes and Toronto Maple Leafs, registering seven goals and 21 assists for 28 points, along with 51 penalty minutes. He established career-highs in 2008-09 with Ottawa, tallying six goals and 15 assists for 21 points in 53 games. Bell tied for second among Senators defensemen in goals, and ranked fourth in assists and points that season. 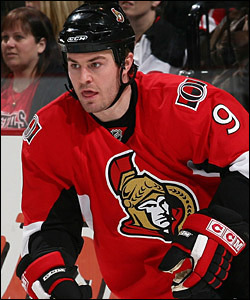 Defenseman Brendan Bell saw his last NHL action with the Ottawa Senators in 2008-09, when he posted career-highs of six goals and 21 points. As a rookie in 2006-07, Bell recorded seven points (one goal, six assists) in 45 contests with Toronto and Phoenix. He notched his first NHL point with an assist on October 28, 2006 at Montreal, and tallied his first NHL goal on January 20, 2007 at Pittsburgh. Bell made his NHL debut as a member of the Toronto Maple Leafs on March 21, 2006. The 6-2, 211-pounder has also skated in 374 career AHL contests with the Syracuse Crunch, Peoria Rivermen, Binghamton Senators, San Antonio Rampage and Toronto Marlies/St. John's Maple Leafs, registering 46 goals and 152 assists for 198 points, along with 376 penalty minutes. In 2009-10, Bell established AHL career-highs in goals (14), assists (38) and points (52) while skating in 71 games with Peoria and Syracuse. He finished that season tied for third among AHL defensemen in goals, fourth in points and assists, and led all blueliners and tied for ninth in the league overall with a career-high, 12 power play goals. Bell also led Syracuse in assists, points and power play goals. Last season, Bell tallied two goals and nine assists for 11 points, along with 14 penalty minutes in 29 games with EHC Biel of the Swiss A-League. He led all team defensemen in assists and points, and tied for third on the team overall with a plus-two rating. Bell also skated in one contest with Omsk Avangard of the Continental Hockey League (KHL), recording two assists in his only appearance. The Ottawa, Ontario native was originally selected as Toronto's third round choice, 65th overall, in the 2001 NHL Entry Draft.